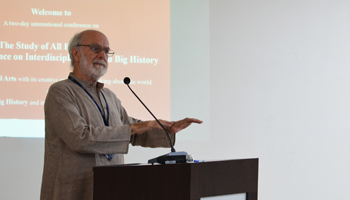 The two-day Conference on Interdisciplinarity and Big History, hosted by the Symbiosis School for Liberal Arts, began on the 23rd of March 2018, with an address by Nivedita Nair, a third-year student at SSLA. She talked about the prime values of interdisciplinarity, about the evolution of history from the time when religion was the centre of all knowledge, to one where science became the new religion, and about the importance of a Liberal Arts education. The session ended with a screening of Eric Law Anderson’s film, The Looking Planet. This was followed by a session on Cosmic Dance and Meditation, conducted by Prof. Prashant Olalekar, from St. Xavier’s College, Mumbai. Prof. Olalekar emphasised the importance of taking care of our bodies, acknowledging the cosmos within, and appreciating the child in us. The third session was on Arts, Humanity, and the Environment. This was introduced by Anwisha Thakur, a second year student at SSLA, and moderated by Prof. Vasudev Menon, of SSLA. Mr. Siddhartha is an ecologist, an author, and a journalist. His speech focused on the reinterpretation of myths, symbols, and festivals, to battle the cultural intolerance in the society. He addressed the ‘Religion versus Human Rights’ debate, something that his NGO is actively involved in. Ms. Juhi Pandey, who works with Kachchh Heritage Resources in Bhuj, Gujarat, then gave a presentation on how acknowledging the interdependence of humans and nature, led to an entire community re-establishing itself after the 2001 Gujarat earthquake. She cited the Raabri community as an example. Fr. Robert Athickal, founder of ‘Tarumitra: Friend of Trees’, spoke about eco-spirituality. These speeches were followed by questions from the moderator, leading to an interesting panel discussion. Another session where the panel discussed a variety of important issues was the session on ‘Cultural Revitalisation - Past, Present, and Future’. Beginning the session, Ms. Singh and Ms. Thandaveswaran presented their paper about the origin and division of racism and discussed the geographical and cultural factors related to races. Mr. Agarwal talked about the medical healthcare centres and conditions in rural areas of India and the significant impact the NGO namely, Barefoot College, has on the conditions. The presentation by Professor Mendanha and Professor Dutta attempted at comparing the portrayal of Sita - an epitome of purity, a loyal and loving wife, and a brave personality - and that of Rama - more godly, and someone who is unaware of his own divinity, and a pompous personality. To end the series of presentations Professor Lowell Gustafson spoke about how his own culture played a huge role in the formation of today’s international conditions and ideologies. During the short break, the Natak Society performed a poetic Theatre act. They ventured into experimental grounds mixing poetry, folk music, dance and performance art to create a provocative and moving piece on man’s relentless onslaught on Mother Nature. The piece showcased the important relationship between mankind and nature, the terrible condition of the North East due to urbanization and globalisation, and about imagination of River in life and literature and art. To conclude, a protest song gaon chhodab nahi by Meghnath was performed by the entire troop. This was a bold and beautiful statement on the current condition of our environment and how we are adversely affecting it. There were salon presentations as well that sparked discussions about a variety of topics under the broad ambit of modernism and postmodernism. There were stalls about queer activism in America, and its spread to the East; the construction of cultural identity over time; on Sherman Alexie, an American novelist and his writings of his experiences from Ingenious America with ancestry from several tribes; and on various civilisations thus explaining the evolution of man over countless centuries. The common area was a host of multiple exhibits and stalls. It also hosted the Jividha exhibit which was an extremely detailed and comprehensive explanation of three major topics and areas. The first such area was the Restlessness of the Earth, the second area was the effect that the Earth’s biodiversity has on itself and the last section involved the effects that human beings have upon the rest of the planet. It was an extremely informative exhibition which evoked a consciousness of what effects we have on our environment. The inaugural session included addresses by various dignitaries including Mrs. Anita Patankar (Director, SSLA), Dr. S.B. Majumdar (Chancellor, Symbiosis International (Deemed) University), as well as our guests from around the world. The session primarily focused on the cruciality of a Liberal Arts education. Prof. Barry appreciated every individual due to whom the conference was possible and also explained the intention behind the conference. Dr. Shweta Sinha Deshpande's further expressed a vote of thanks to all the members present at the conference. The next session was on interdisciplinarity and super-interdisciplinarity which was a roundtable discussion where the panelists contributed and elevated the essence of interdisciplinarity of the big history project with their specialised academia. Mr. Gustafson, being a political scientist, contributed to the big history project by using science to understand polity and further stressed on the diversity in ideas, cultures and traditions. Lucy Laffitte presented Little Big History i.e. the topic being specifically looked at from the Big History lens. Hirofumi Katayama discussed the role of economics and the reductive nature of the discipline. John Clammer proposed a hypothesis to the audience that encompassed the transcending limit of worldviews that the various disciplines impose over the future relationship of the human wills. The last discussion of the day titled Indigenous Understanding, Rights and Contributions, was also a roundtable discussion where various panelists shared their ideas on various indigenous topics. Dr. Carl Rangad initiated the discussion by explaining the meaning of Meghalaya. Dr. Carl spoke about how the ethnic tribes lose their identity as they step out of their identity though they are proud of their tribe. He believes that the youth today focuses more on modernity than on ethnicity. He proposed that this structure of functioning can be defended by indigenous farming and threw some light upon the Meramo Festival, as an ode to Mother Earth. The dais was then taken by R.K. Debbarma, who lightened the mood of the conference, bringing in the big picture of Big History from an indigenous perspective. He suggested solutions to racial discrimination by perforation of history through the borders it has been contained in. It was certainly a critical session as issues of racial discrimination were brought forth, another opinion from the western indigenous tribe was also brought in from the audience. However, the session ended on a rather positive note where a brighter perspective was put forth that apprised the panelists themselves.